We get this question a lot — who is St. Baldrick of the St. Baldrick’s Foundation? Is he the patron saint of the shaved? Does he have something to do with male pattern baldness? Would he be the wrong guy to pray to for a good hair cut? No, no, and — maybe? What we’re trying to say is that a saint named Baldrick doesn’t really exist. The name St. Baldrick’s is a mashup of St. Patrick’s Day and the word “bald” — two things which sum up the humble beginnings of the St. Baldrick’s Foundation, a childhood cancer foundation that funds grants for childhood cancer research through shaving events and other fundraisers across the globe. It all started with three guys in a bar on St. Patrick’s Day and a challenge to go bald to raise money for childhood cancer research. Their goal was $17,000. They ended up raising $104,000, and St. Baldrick’s was born. Childhood cancer research is incredibly underfunded — only 4% of government funding is solely dedicated to childhood cancer research. St. Baldrick’s Foundation has worked since its founding to fill that gap. St. Baldrick’s is the biggest funder of childhood cancer research grants behind the United States government. Since we became a foundation, we’ve funded more than $200 million in grants to intrepid researchers searching tirelessly for better treatments and cures. And it’s all thanks to people like YOU! Yep, we are those crazy head-shaving people. 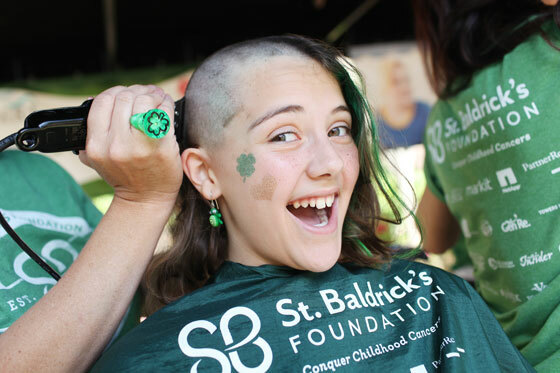 St. Baldrick’s is a volunteer-powered charity. People like you give kids better, safer treatments and hope for a cure. Volunteer at an event, register to shave your head, or plan an event near you to raise money for childhood cancer research. You can be sure that the money you raise will change lives and save lives. Lifesaving research is funded by people like YOU. Donate now and help us take childhood back from cancer. Since St. Baldrick’s became a foundation in 2005, we’ve shaved over 400,000 heads. Will yours be next? Find an event near you! Can’t find one? You can still be a virtual shavee℠. Would you like to plan a party for a good cause? Start a head-shaving event today! Don’t want to shave your head? You can Do What You Want! From birthday parties to retro proms to marathons, you can do just about anything to raise money for pediatric cancer research.